Do You Really Need That Contact Lens Training Room? Most practices I consult with need more space and if they had it, they could increase productivity and profitability. Of course, moving to a larger office or buying a building are good ways to go, but in many cases, that is not practical. At least not right away. Utilizing the space you have now for the highest purpose is a smart strategy. There may be several ways to rework your present floor plan with minor expense, but I find the contact lens room is often a very functional space with a low priority purpose. Let’s dig deeper. A place for staff to work, possibly for ordering contacts and tracking them for patient pick-up or delivery. While all those tasks are needed, they do not necessarily need a dedicated room. Consider how you use your contact lens room and if there might be another area you could use for each function. All you really need for diagnostic lens sets is open shelves to set them on. If you have an open space or a wide hallway, a carpenter could build a custom design of shelves with the depth and height needed to display most of the sets from the manufacturers. Ideally, this would be near the exam rooms. I don’t think the lens sets need to be hidden; I think they are impressive to patients. Diagnostic lenses could also go into a closet or laboratory. I actually believe that contact lens training rooms are kind of outdated. 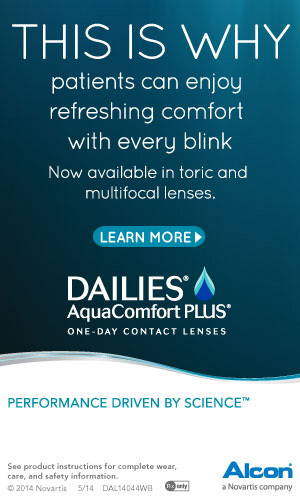 They make me hark back to the old hard contact lens days when ODs would hold classes and training sessions took a long time. Today, soft lenses are quite easy to insert and the vast majority of fittings are on patents who have already worn lenses. Sure, we still train patients but I don’t think it is a big deal and I don’t want to make it seem as if it is. I also don’t think it requires much privacy. I could easily see a technician and a patient sitting across from each other at a dispensing table in a corner of the optical and the patient practicing in front of a mirror. If other people see that, maybe they will be interested in contacts also. CL training can also occur in an exam room with a hospital table rolled up to the exam chair. Staff members certainly need a place to work and if that occurs in the contact lens room, perhaps you can find another place for them with a computer and a phone, such as in a lab or other office space. I realize that staff may dislike changes that disrupt their work space, but you must consider the potential for a higher purpose in that space: a revenue-producing purpose. The first thing that comes to mind when I think about how to use the space is an additional exam room. The size of most contact lens rooms is usually perfect for this purpose and they usually have a sink. The extra exam room can be used by technicians and the doctor. The goal is for the staff to get the next patient ready while the doctor is in the other exam room. Ideally, the doctor just moves from one exam room to the other. Another great purpose is for special diagnostic testing. That could be an OCT, dedicated visual fields, retinal imaging or macular pigment density screening. All of these purposes produce revenue. What can you do with your contact lens room?